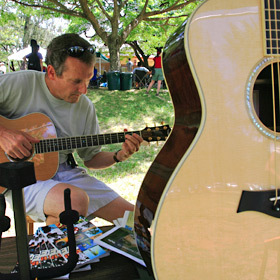 STRING FLING » Dave Cureton of Pleasanton, Calif., tried out a Taylor acoustic at the Island Guitars tent yesterday afternoon during the 24th Annual Hawaiian Slack Key Guitar Festival at Kapiolani Bandstand. This year's theme was "Oahu Style" and featured ki hoalu artists young and old. Hawaii's teen license restrictions lack stiff penalties that might prevent fatal crashes. Summer-Lynn Mau and Orem "Benson" Kauvaka were fatally struck by a vehicle where two friends had died in a traffic accident only hours earlier. The DOE explores incentives to keep experienced faculty from transferring out. Young photographers gain and share insights in an emotional exhibit. Hawaii's first foe this season boasts a balanced offense. Peter Castillejos believes his keys to success are getting to know people and offering good service. City Council member Rod Tam has found that appealing his property tax assessment is no easy task. The City Council has approved a bill to cap the number of Waikiki parades and events.